Living faith is inspired in the human heart by contemplation of the word of God and by the Holy Spirit. For this reason we should read and heed the word of God and pray that God Himself ignite the lamp of faith in our heart. The fear of God arises most often from contemplation of the omnipresence of God and His omniscience. God is in essence everywhere present; and wherever we may be, He is with us; and whatever we may do, say, think, and undertake, we do, say, think, and undertake all before His holy eyes. And He knows our deeds far better than we do ourselves. Think about this, O Christian, and heed it, and with God’s help the fear of God will be born in you. […] Keep God, then, before your spiritual eyes and you will have the fear of God, imitating the Psalmist, “I beheld the Lord ever before me” (Ps. 15:8). […] While standing in church attend diligently to the reading and singing. This gives birth to compunction, true prayer, heartfelt singing and thanksgiving. Avoid, then, standing bodily in church while wandering outside the church in mind, and standing bodily before God while wandering about in spirit in worldly affairs, lest that saying be applied to you, “his people draweth nigh unto Me with their mouth, and honoureth Me with their lips; but their heart is far from Me” (Mt. 15:8). While standing bodily in church, then, stand with heart and spirit as you stand before God. When you look upon the icons of the saints, call to mind that One is the Creator that created them and you, and that His purpose was the same for them as it is for you, that is, to save both them and you. They are glorified, and before you lies the same glory, only imitate their lives and you shall be saved. Prayer consists not only in standing and bowing before God in body, and in reading written prayers, but even without that it is possible to pray in mind and spirit at all times and in everyplace. You can do it while walking, sitting, reclining, among people, and in solitude. Raise up your mind and heart to God, and so beg mercy and help from Him. For God is everywhere and in every place, and the doors to Him are always open, and it is easy to approach Him, not as with man. And we can approach Him with faith and with our prayer everywhere and at all times, and in every need and circumstance. We can say to Him mentally at any time, “Lord, have mercy, Lord help!” and so on. 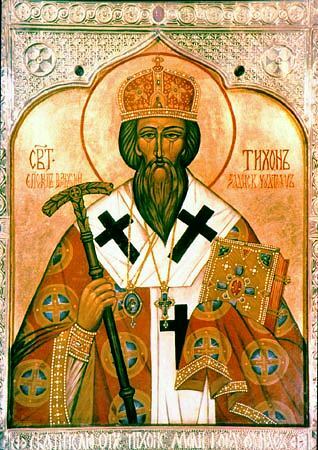 Tikhon of Zadonsk (1724-1783; Russian Orthodox): extract @ Kandylaki from Journey to Heaven: Counsels On the Particular Duties of Every Christian by Our Father Among the Saints, Tikhon of Zadonsk, Bishop of Voronezh and Elets (Jordanville, NY: Holy Trinity Monastery, 2004) . He came down to clothe the Apostles with power, and to baptize them. For the Lord says, ye shall be baptized with the Holy Ghost not many days hence (Acts 1:5). This grace was not in part, but His power was in full perfection. For as he who plunges into the waters and is baptized is encompassed on all sides by the waters, so were they also baptized completely by the Holy Ghost. The water however flows round the outside only, but the Spirit baptizes also the soul within, and that completely. And wherefore wonderest thou? Take an example from matter; poor indeed and common, yet useful for the simpler sort. The fire passing in through the mass of the iron makes the whole of it fire, so that what was cold becomes burning and what was black is made bright. If fire which is a body thus penetrates and works without hindrance in iron which is also a body, why wonder that the Holy Ghost enters into the very inmost recesses of the soul? And lest men should be ignorant of the greatness of the mighty gift coming down to them, there sounded as it were a heavenly trumpet. For suddenly there came from heaven a sound as of the rushing of a mighty wind (Acts 2:2), signifying the presence of Him who was to grant power unto men to seize with violence the kingdom of God; that both their eyes might see the fiery tongues, and their ears hear the sound. And it filled all the house where they were sitting; for the house became the vessel of the spiritual water; as the disciples sat within, the whole house was filled. Thus they were entirely baptized according to the promise, and invested soul and body with a divine garment of salvation. And there appeared unto them cloven tongues like as of fire, and it sat upon each of them; and they were all filled with the Holy Ghost. They partook of fire, not of burning but of saving fire; of fire which consumes the thorns of sins, but gives lustre to the soul. This is now coming upon you also, and that to strip away and consume your sins which are like thorns, and to brighten yet more that precious possession of your souls, and to give you grace; for He gave it then to the Apostles. And He sat upon them in the form of fiery tongues, that they might crown themselves with new and spiritual diadems by fiery tongues upon their heads. A fiery sword barred of old the gates of Paradise; a fiery tongue which brought salvation restored the gift. 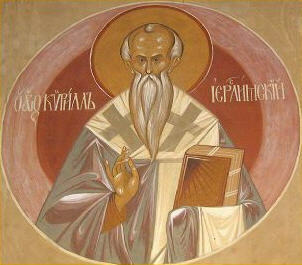 Cyril of Jerusalem (c. 313-386): Catechetical Lectures 17, 14-15. In the gospel of John the Lord says: In this will all men know that you are my disciples, if you have love for each other. In a letter of the same apostle we read: Beloved, let us love one another, for love is from God, and everyone who loves is born of God and knows God; he who does not love does not know God for God is love. The faithful should therefore enter into themselves and make a true judgment on their attitudes of mind and heart. If they find some store of love’s fruit in their hearts, they must not doubt God’s presence within them. If they would increase their capacity to receive so great a guest, they should practice greater generosity in doing good, with persevering charity. Any time is the right time for works of charity, but these days of Lent provide a special encouragement. Those who want to be present at the Lord’s Passover in holiness of mind and body should seek above all to win this grace, for charity contains all other virtues and covers a multitude of sins. As we prepare to celebrate that greatest of all mysteries, by which the blood of Jesus Christ did away with our sins, let us first of all make ready the sacrificial offerings of works of mercy. In this way we shall give to those who have sinned against us what God in his goodness has already given to us. Let us now extend to the poor and those afflicted in different ways a more open-handed generosity, so that God may be thanked through many voices and the relief of the needy supported by our fasting. No act of devotion on the part of the faithful gives God more pleasure than that which is lavished on his poor. Where he finds charity with its loving concern, there he recognizes the reflection of his own fatherly care. In these acts of giving do not fear a lack of means. A generous spirit is itself great wealth. There can be no shortage of material for generosity where it is Christ who feeds and Christ who is fed. In all this activity there is present the hand of him who multiplies the bread by breaking it, and increases it by giving it away.The giver of alms should be free from anxiety and full of joy. His gain will be greatest when he keeps back least for himself. 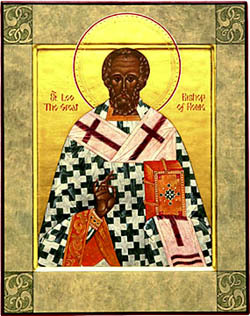 Leo the Great (c.400-461): Sermon 48, 3-5 (10th Lenten sermon) @ Crossroads Initiative. Let us examine the all-perfect Name of Goodness, which is indicative of the whole progressions of Almighty God. But first let us invoke the supremely good, and super-good Triad – the Name which indicates Its whole best Providences. For, we must first be raised up to It, as Source of good, by our prayers; and by a nearer approach to It, be initiated as to the all good gifts which are established around It. For It is indeed present to all, but all are not present to It. But then, when we have invoked It, by all pure prayers and unpolluted mind, and by our aptitude towards Divine Union, we also are present to It. For, It is not in a place, so that It should be absent from a particular place, or should pass from one to another. But even the statement that It is in all existing beings, falls short of Its infinitude (which is) above all, and embracing all. Let us then elevate our very selves by our prayers to the higher ascent of the Divine and good rays. For it is as if a luminous chain were suspended from the celestial heights, reaching down hither, and we, by ever clutching this upwards, first with one hand, and then with the other, seem indeed to draw it down. But, in reality we do not draw it down, it being both above and below, but ourselves are carried upwards to the higher splendours of the luminous rays. Or it is as if, after we have embarked on a ship, and are holding on to the cables reaching from some rock, such as are given out, as it were, for us to seize, we do not draw the rock to us, but ourselves, in fact, and the ship, to the rock. Or to take another example, if any one standing on the ship pushes away the rock by the sea shore, he will do nothing to the stationary and unmoved rock, but he separates himself from it, and in proportion as he pushes that away, he is so far hurled from it. Denys the Areopagite (late 5th-early 6th century? ): On the Divine Names 3, 1. January 3rd was the feast of the Holy Name of Jesus. 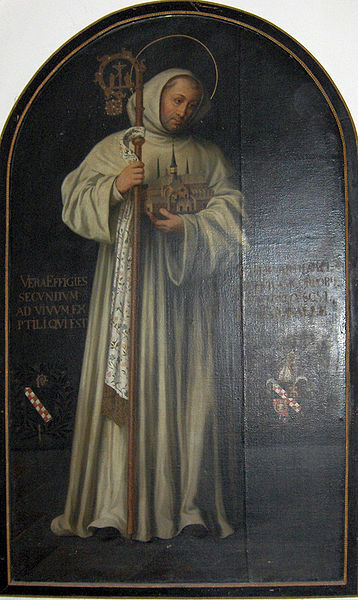 Bernard of Clairvaux (1090-1153): translated by Edward Caswall (1814-1878) @ CyberHymnal. December 7th is the feast of St Ambrose of Milan. For the powers of heaven shall be moved: and then they shall see the Son of man coming in a cloud (Luke 21:26-27). And in like manner the coming of the Son of man is longed for, so that by His presence there may be accomplished in the whole world of angels and of men, that which is wrought in single souls, who, with all fitting dispositions, receive Christ. So the Powers of heaven, at the Coming of the Lord of salvation, will also attain to an increase of grace; for He is the Lord of the Powers as well, and they will tremble at this appearance among them of the fulness of the glory of the divinity. Then too the Powers that proclaim the glory of God (Ps. 18) shall also tremble before this fuller revealing of His glory, as they gaze on Christ. […] Paul also tells how we may see Christ: for when they shall be converted to the Lord, a veil shall be taken away, and you will behold Christ (2 Cor. 3:16). You will behold Him in the clouds. Not that I believe that Christ will come in lowering mist, or in the chill rain torrent, for when they appear, they cloak the sky in gloomy darkness. How then shall He set His Tabernacle in the sun (Ps. 18:6), if His coming be in the rain clouds? But there are clouds which serve, as is fitting, to veil the splendour of the divine mystery. There are clouds which moisten with the dew of spiritual refreshment. Consider the cloud in the Old Testament: He spoke to them, it says, in the pillar of the cloud (Ps. 987). He spoke indeed through Moses, and by the mouth of Joshua, who bade the sun stand still that he might have the light of the lengthened day. So Moses and Joshua were clouds. And observe also that the Holy Ones are clouds, who fly as clouds and as doves to their windows (Is. 60:8). Above me, like clouds, are Isaiah and Ezekiel, of whom the former has shown me, through the Cherubim and Seraphim, the holiness of the Divine Trinity. The Prophets all are clouds; in these clouds Christ came. He came in a cloud in the Canticle, serene and lovely, refulgent with the joy of the Bridegroom (Cant. 3:11). He came and in a swift cloud, becoming Incarnate through the Virgin, for the prophet saw Him come as a cloud from the east (Is. 19:1). And rightly did he call Him a swift cloud Whom no stain of earth weighed down. Consider the cloud in which the Holy Spirit descended, and from wherein the power of the Most High shadowed forth (Lk. 1:35). Ambrose of Milan (c. 337-397): Homilies 38 (PL 76, col. 1281), Translated by M.F. Toale, D.D. @ Lectionary Central. “If we be dead with Christ, we believe that we shall also live with Him” (Romans 6:8). To be dead with Christ, is to hate and turn from sin; and to live with Him, is to have our hearts and minds turned towards God and Heaven. To be dead to sin, is to feel a disgust at it. We know what is meant by disgust. Take, for instance, the case of a sick man, when food of a certain kind is presented to him—and there is no doubt what is meant by disgust. Consider how certain scents, which are too sweet or too strong, or certain tastes, affect certain persons under certain circumstances, or always—and you will be at no loss to determine what is meant by disgust at sin, or deadness to sin. —and you will understand the sort of feeling which is implied in being alive with Christ, alive to religion, alive to the thought of heaven. Our animal powers cannot exist in all atmospheres; certain airs are poisonous, others life-giving. So is it with spirits and souls: an unrenewed spirit could not live in heaven, he would die; an Angel could not live in hell. The natural man cannot live in heavenly company, and the angelic soul would pine and waste away in the company of sinners, unless God’s sacred presence were continued to it. To be dead to sin, is to be so minded, that the atmosphere of sin (if I may so speak) oppresses, distresses, and stifles us—that it is painful and unnatural to us to remain in it. To be alive with Christ, is to be so minded, that the atmosphere of heaven refreshes, enlivens, stimulates, invigorates us. To be alive, is not merely to bear the thought of religion, to assent to the truth of religion, to wish to be religious; but to be drawn towards it, to love it, to delight in it, to obey it. Now I suppose most persons called Christians do not go farther than this,—to wish to be religious, and to think it right to be religious, and to feel a respect for religious men; they do not get so far as to have any sort of love for religion. So far, however, they do go; not, indeed, to do their duty and to love it, but to have a sort of wish that they did. 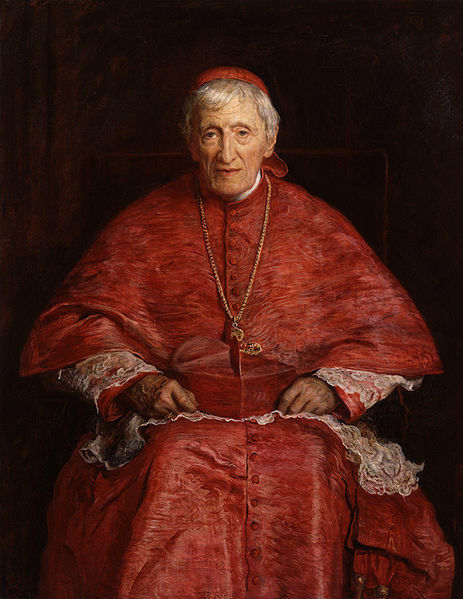 John Henry Cardinal Newman (1801-1890): Parochial and Plain Sermons vol. 7, 13: Love of Religion, a New Nature. God’s gifts are very great, but we are small and straitened in our capacity of receiving. which “eye hath not seen,” for it is not colour; which “the ear hath not heard,” for it is not sound; and which hath not ascended into the heart of man, for the heart of man must ascend to it. and may more warmly excite ourselves to obtain an increase of its strength. For the effect following upon prayer will be excellent in proportion to the fervour of the desire which precedes its utterance. 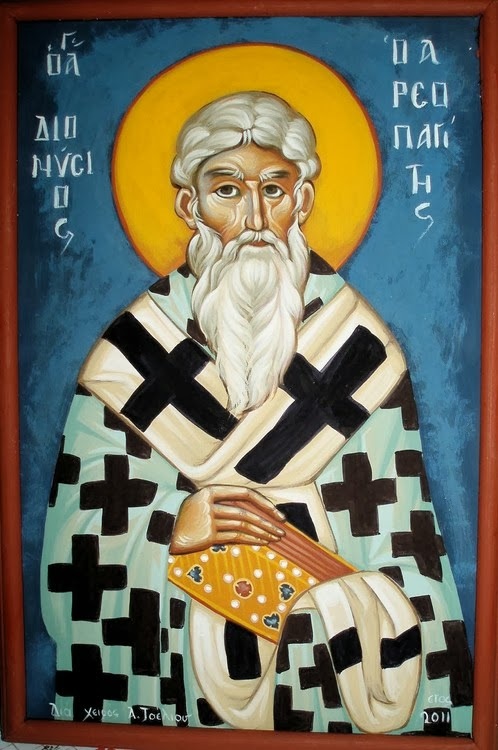 And therefore, what else is intended by the words of the apostle: “pray without ceasing” than “desire without intermission, from Him who alone can give it, a happy life, which no life can be but that which is eternal”? This, therefore, let us desire continually from the Lord our God; and thus let us pray continually. But at certain hours we recall our minds from other cares and business, in which desire itself somehow is cooled down, to the business of prayer. We admonish ourselves by the words of our prayer to fix attention upon that which we desire, lest what had begun to lose heat become altogether cold, and be finally extinguished, if the flame be not more frequently fanned. When the same apostle says “let your requests be made known unto God,” this is not to be understood as if thereby they become known to God, who certainly knew them before they were uttered. Rather, it should be understood in this sense: that they are to be made known to ourselves in the presence of God by patient waiting upon Him, not in the presence of men by ostentatious worship. Or perhaps our requests may be made known also to the angels that are in the presence of God, that these beings may in some way present them to God, and consult Him concerning them. Perhaps they bring to us, either manifestly or secretly, that which, hearkening to His commandment, they may have learned to be His will, and which must be fulfilled by them. Augustine of Hippo (354-430): Letter to Proba, VIII,17 – IX, 18 @ Crossroads Initiative. How can God fail to be everywhere, when you read of the Spirit of God that the Spirit of the Lord has filled the whole world? For where the Spirit of the Lord is, there is the Lord God. I fill heaven and earth, says the Lord. Where then can he fail to be who fills everything? Or how can we all share in his fullness unless he is near all of us? So, knowing that God is everywhere, and fills the sky, the earth, and the sea, David says: Where can I escape from your Spirit, where flee from your face? If I go up to heaven you are there; if I go down to Sheol you are there; if I take flight before dawn to dwell at the sea’s furthest end, even there your hand will lead me and your right hand hold me fast. In what few words he has shown that God is everywhere, and that wherever the Spirit of God is, there is God, and where God is there is his Spirit! The union of the indivisible Trinity is portrayed here, since it is the Son of God who pro­nounced these words through the mouth of the prophet. 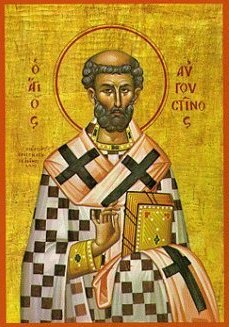 He spoke in his human nature, for he descended to earth in the incarnation, ascended to heaven in the resurrection, and through his bodily death went down to the underworld to free the prisoners. […] Since we know that the sun shines everywhere, can we doubt that the splendor of God’s glory and the image of his being shines everywhere? What could the Word of God, the eternal splendor, not penetrate, when he illuminates even the hidden mind, which the sun itself cannot penetrate? He penetrates the soul, then, and illuminates it as with the brightness of eternal light. But although his virtue is poured out among all and into all and over all, since he was born of the Virgin for the sake of all, both good and bad, just as he com­mands his sun to rise over good and bad, nevertheless he warms only those who come near to him. For just as people shut out the sun’s brightness when they close the windows of their houses and choose to live in darkness, so those who turn their backs on the Sun of Righteousness cannot see its splendor. They walk in darkness, and it is plain to everyone that they them­selves are the cause of their blindness. Open your windows, then, so that your whole house shines with the brightness of the true Sun; open your eyes so that you can see the Sun of Righteousness rising for you. 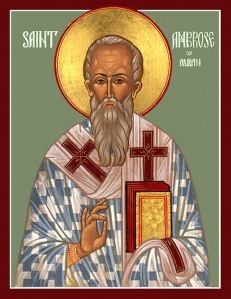 Ambrose of Milan (c. 337-397): On Psalm 118, 19, 36-39 (CSEL 62, 440-442); from the Monastic Office of Vigils, Sunday of the Thirtieth Week in Ordinary Time Year 1 @ Dom Donald’s Blog. Turn your eyes upon yourself and look at yourself inwardly…. You will find your Master; He will not fail you: indeed, the less outward comfort you have, the greater the joy He will give you. He is full of compassion and never fails those who are afflicted and out of favour if they trust in Him alone…. Either you believe this or you do not: if you do, as you should, why do you wear yourselves to death with worry? […] I should like to be able to explain the nature of this holy companionship with our great Companion, the Holiest of the holy, in which there is nothing to hinder the soul and her Spouse from remaining alone together, when the soul desires to enter within herself, to shut the door behind her so as to keep out all that is worldly and to dwell in that Paradise with her God. I say “desires”, because you must understand that this is not a supernatural state but depends upon our volition, and that, by God’s favour, we can enter it of our own accord: … for without it nothing can be accomplished and we have not the power to think a single good thought. For this is not a silence of the faculties: it is a shutting-up of the faculties within itself by the soul. There are many ways in which we can gradually acquire this habit…. We must cast aside everything else, they say, in order to approach God inwardly and we must retire within ourselves even during our ordinary occupations. If I can recall the companionship which I have within my soul for as much as a moment, that is of great utility. But as I am speaking only about the way to recite vocal prayers well, there is no need for me to say as much as this. All I want is that we should know and abide with the Person with Whom we are speaking, and not turn our backs upon Him; for that, it seems to me, is what we are doing when we talk to God and yet think of all kinds of vanity. The whole mischief comes from our not really grasping the fact that He is near us, and imagining Him far away—so far, that we shall have to go to Heaven in order to find Him. How is it, Lord, that we do not look at Thy face, when it is so near us? We do not think people are listening to us when we are speaking to them unless we see them looking at us. And do we close our eyes so as not to see that Thou art looking at us? 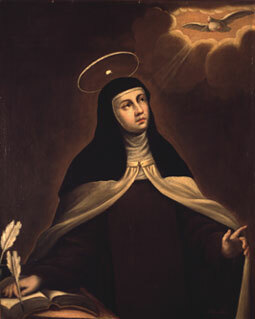 Teresa of Avila (1515-1582): Way of Perfection, 29.